When Roger and I first got married I did all of the grocery shopping by myself, but once we switched over to Publix I discovered he didn’t want to be left out of the fun. The truth is, he didn’t want to miss out on all of the 2 for 1 ice cream, soda, and chip deals! We tend to do all of our shopping based around their deals of the week – and more often then not ice cream is on sale. Which explains why we have three 3 cartons of ice cream in our freezer – not to mention all of the other sugary delights packed in there. During our weekly trip to Publix we tend to make a lot of decisions on what we are going to eat while we are at the store. I think it takes us twice as long as a normal couple to do our grocery shopping not only because we have to go up and down every aisle so “we” don’t miss anything, but also because we usually wait until we are at the store to decide what type of soup we are going to make Friday night. 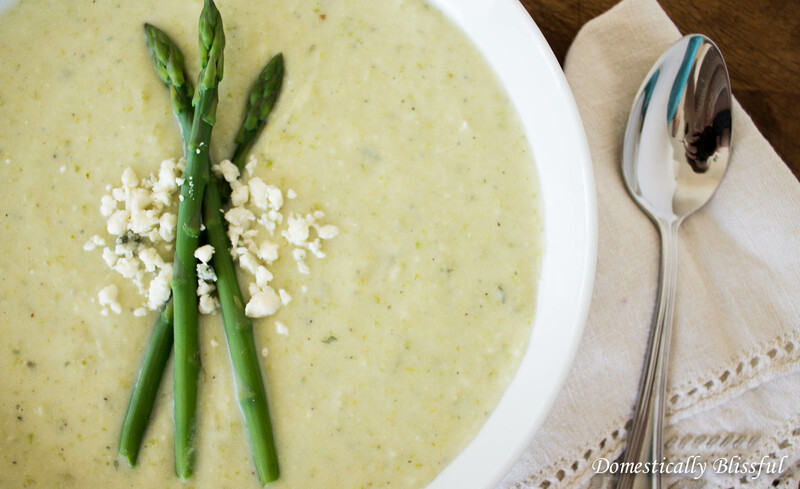 Our last trip to Publix led us to the decision to make this Cream of Asparagus Soup. Boy am I glad the asparagus was such a great price! 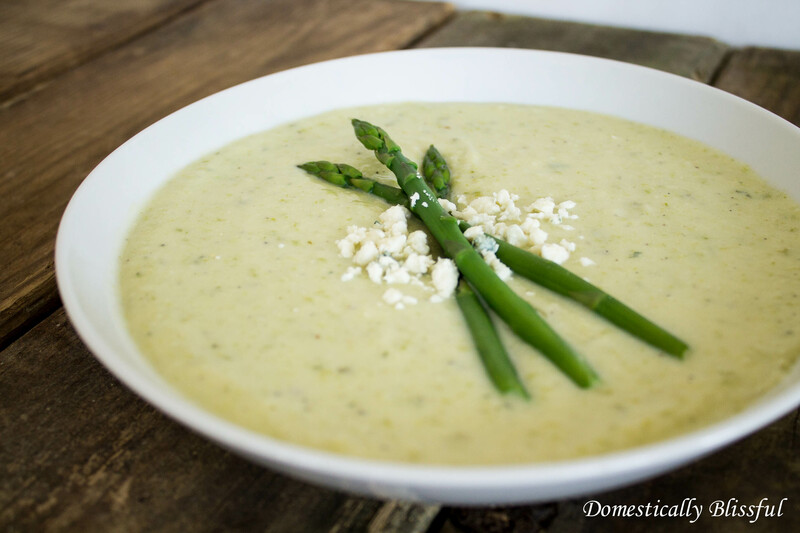 This Cream of Asparagus Soup is perfectly smooth and creamy with a wonderful variety of flavors. I can’t decide what my favorite part is, the asparagus heads, or the pesto, or the super special secret ingredient – Gorgonzola Cheese! First, boil the diced potatoes. 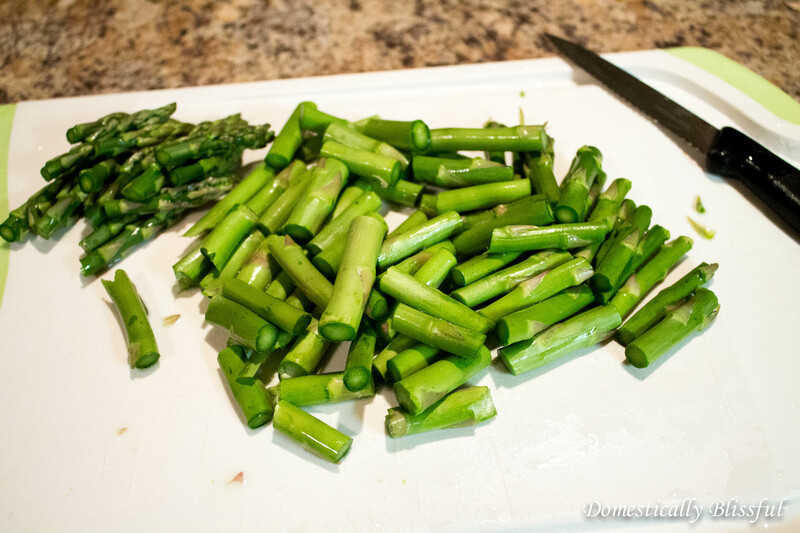 While the potatoes are cooking cut up the asparagus so that they are about an 1 ½ inches long. The heads of the asparagus will later be used as garnish so I start by cutting from the top to the bottom to ensure that the heads are all about the same size. Once the potatoes are a few minutes away from being tender add the asparagus to the boiling pot of potatoes. 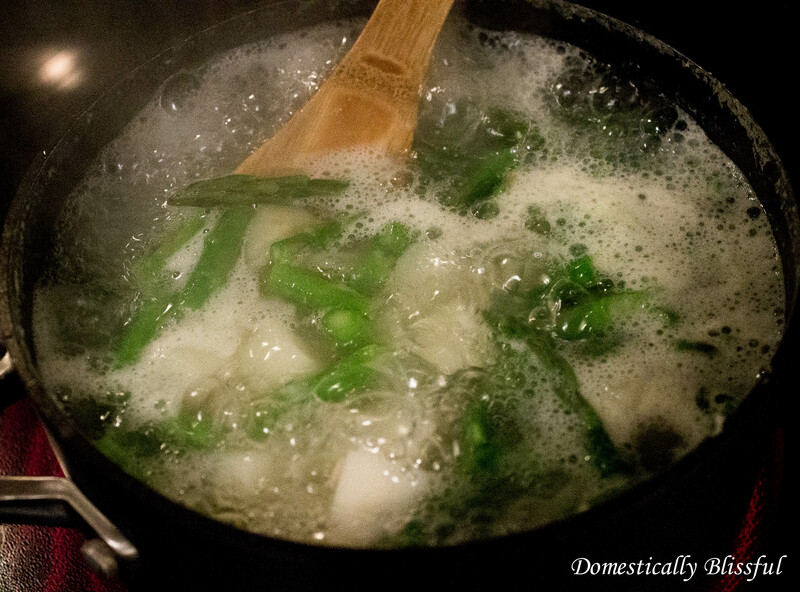 Continue to boil the asparagus and potatoes for 2-3 minutes until tender. During this time fill a small bowl with ice and water. Drain the potatoes and asparagus into a colander. 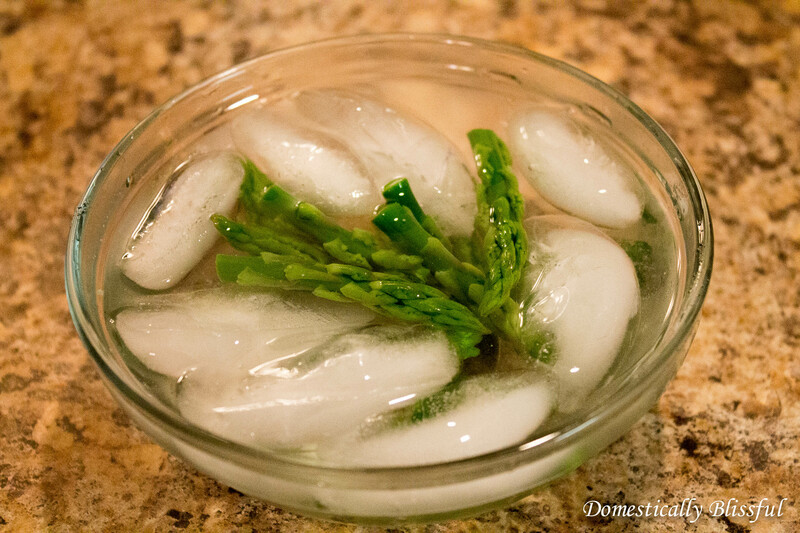 Working quickly and carefully blanch the asparagus heads by picking them out of the colander and placing them in the ice water – adding more ice as needed. 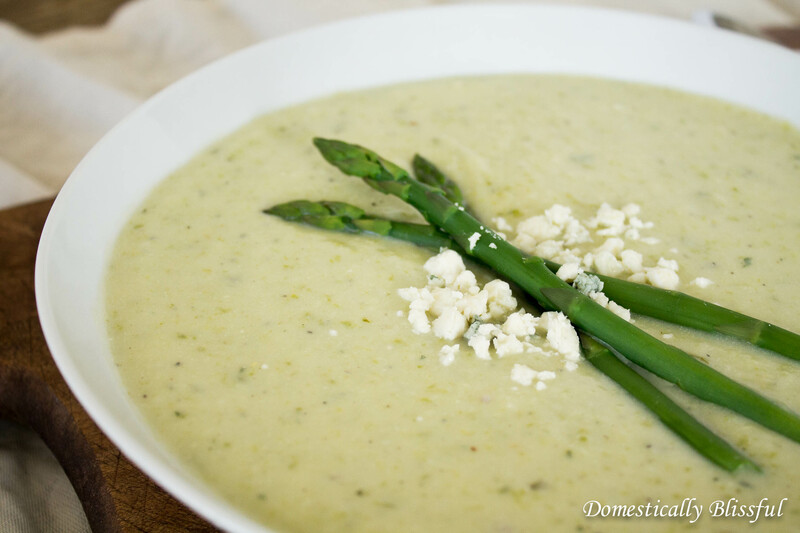 This will shock the asparagus, keeping it from overcooking, and ensuring that they stay a vibrant green color. 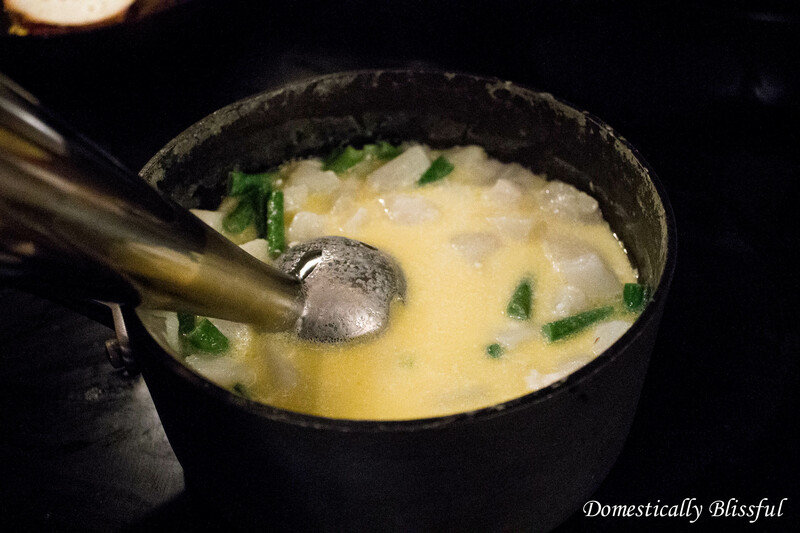 Melt the 2 tablespoons of butter in the pot that you cooked the potatoes and asparagus in at medium heat. 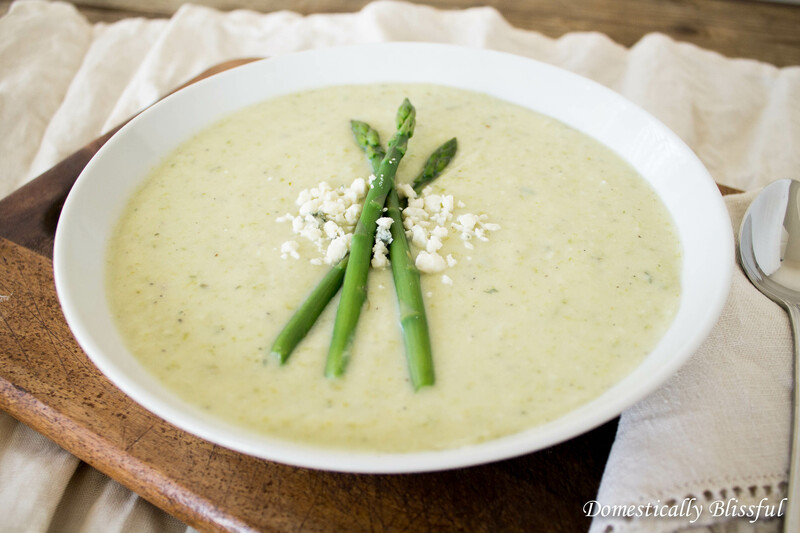 Then add ½ cup half and half, ½ cup vegetable broth, 1 cup milk, 1 tablespoon cream cheese, 2 deli slices of havarti cheese, and 2 tablespoons gorgonzola cheese. 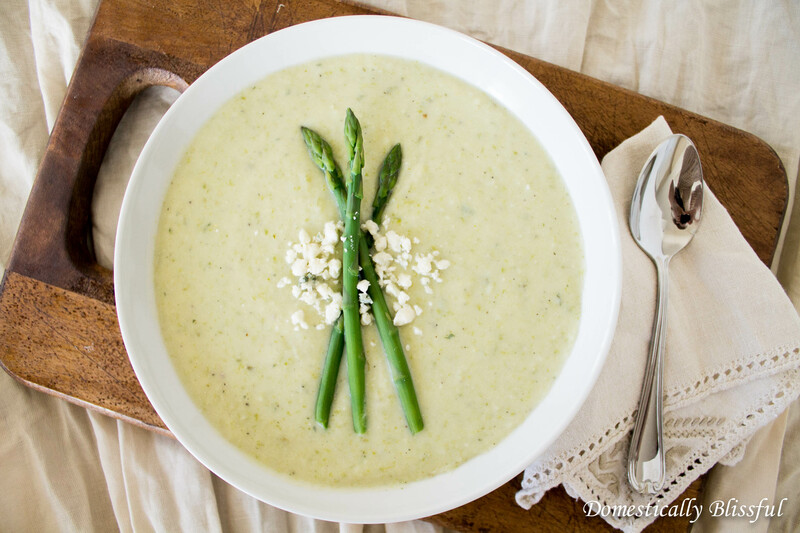 Once melted add the potatoes and asparagus from the colander and blend the ingredients together using a hand blender – affiliated link. Next, stir in 1 teaspoon black pepper, 1 teaspoon salt, 1 teaspoon crushed dried parsley, and 1 heaping teaspoon pesto. 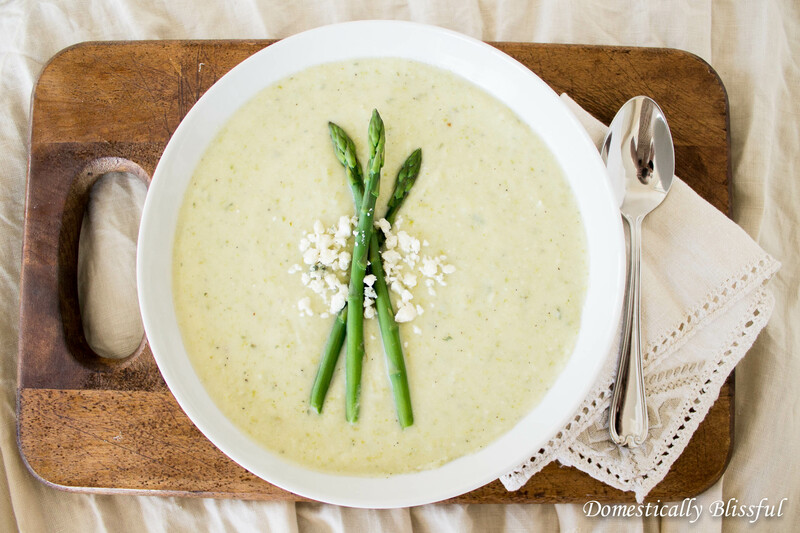 Serve with a sprinkling of pepper, Gorgonzola cheese, and a few heads of asparagus. Melt the 2 tablespoons of butter in the pot that you cooked the potatoes and asparagus in at medium heat. Then add ½ cup half and half, ½ cup vegetable broth, 1 cup milk, 1 tablespoon cream cheese, 2 deli slices of havarti cheese, and 2 tablespoons gorgonzola cheese. 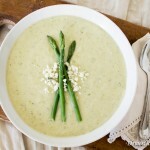 Once melted add the potatoes and asparagus from the colander and blend the ingredients together using a hand blender.